At 5 p.m. tonight, Dec. 21, Venus and Jupiter dominate the sky; Uranus and Neptune are visible between them with a small telescope. Just after sunset tonight (Dec. 21) the two brightest planets will be shining, weather permitting. Venus, the brightest, rides low in the southwest just above the setting sun. Jupiter, the second brightest planet, is high in the south. If you have a telescope, you can find Uranus and Neptune between Venus and Jupiter. The sloping line across the sky that the four planets define is called the ecliptic, because it is the line along which eclipses take place. The sky maps of the planets available here show where to look to try to spot them this week. Pay particular attention to Spica because, over the next year, the moon will make numerous close passes near Spica, actually passing in front of the star and occulting it on a few occasions. Such close approaches between astronomical objects are called conjunctions. While not of much importance to modern astronomers, they are always interesting to observe. At 6 a.m. local time on Dec. 22, the rest of the planets are visible: Mercury, Saturn, and Mars, along with the Moon, and bright stars Arcturus, Regulus and Spica. Tonight's array of the planets is the opposite of a conjunction. None of the planets are particularly near each other. What makes this event special is that the planets are almost equally spaced around the ecliptic, the only large gap being between Mars and Jupiter, 135 degrees. Your closed fist held at arm's length covers about 10 degrees of the night sky. The only time you can see both Mars and Jupiter tonight is around midnight. Jupiter will be setting in the west just as Mars is rising in the east. So, try to get out there tonight and see how many of the planets you can see. 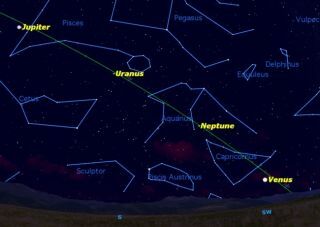 Uranus and Neptune will be difficult in the evening, because they are faint and require a telescope. Mercury will be difficult in the morning because it will be close to the rising sun, but use the thin crescent moon as a guide to its location. If you're clouded out tonight, keep trying over the next week, as the planets don't move very quickly. One planet might get overlooked: the Earth. After you've looked at the seven major planets in the sky, don't forget to look down at your feet and see your home planet. If you snap a stunning photo of the planets tonight and would like to share the experience with SPACE.com, send images or comments to Managing Editor Tariq Malik at: tmalik@space.com.